So….by now you are wondering what happened to the 5 cuttings I had left over. Well I did not really have anything in mind for them so I decided to utilize them in a possible shohin clump style trident. I thought about the hole in the tile trick, planting them into old Mariah Carey CD’s and drilling holes in ceramic plates from the dollar store. Jeesh….where can I find an old Mariah….dollar sto….oh forget it I will just use what I think should be used. I went to my junk pile and found a stack of clay pot water dishes that my wife used to have under the African Violets in the garden window in the kitchen. 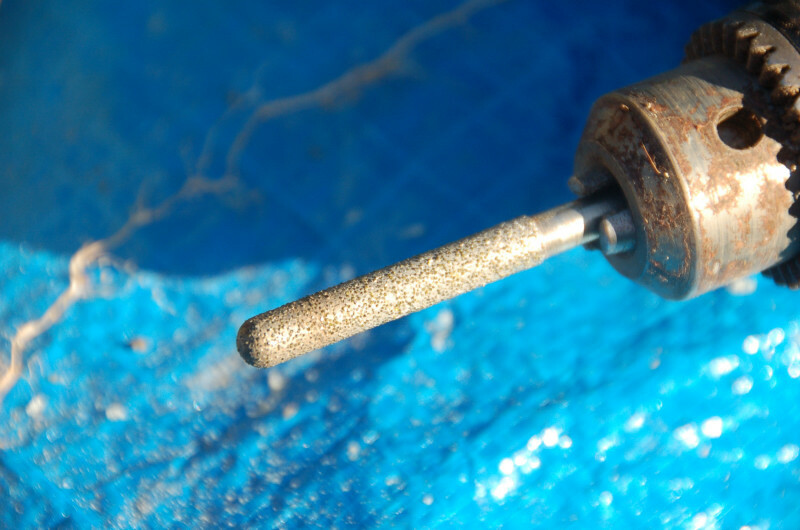 I have this diamond coated 1/4 bullnose bit I use to cut holes in tile for can lights and faucets when they are repaired. It went thru this soft clay pot like butter. Ok, have to ask the noob questions… what happens to the trunks in this set up? Do they fuse together or just the root system? When it gets repotted, do you just crack the saucer? The trunks fuse above the saucer. But the purpose of the saucer is that the tree will put roots out above it and create a flat, radial root system. Then you cut off the roots below the saucer and plant it in a more shallow container. It’s a type of ground layering to create better roots.